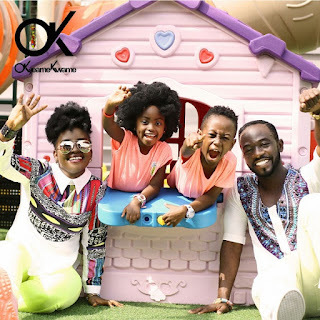 If you are looking for a man who’s as faithful as a dog, then certainly Okyeame Kwame is one–IF you don’t agree, his wife does and that’s all that matters. The celebrated musician and his wife, Annica are celebrating 9 years of successful marriage without any taint of infidelity. His wife believes that he would never cheat on her and was very confident about it in an interview they had with Graphic Showbiz. “I’ve never suspected him and I don’t think he does that. I know a lot of women will say it’s not true but for me it is true. It is not living in a fool’s paradise, what we have is real,” she said. The couple who have a daughter and a son together are one of the few celebrities who has maintained a successful marriage and have been together for 13 years but married for 9 years. “Not at all. Kwame is very transparent so everything he does he comes back to me. He likes women that are very nicely shaped and sometimes when we’re together and we see such women, I point them out to him. Sometimes, when he travels and sees them, he sends me pictures and we have a good laugh about it. It’s fun,” she said. “And we share phones, we don’t snoop around each other’s things but we have this rule that we don’t put codes on our phones unless we think the kids will tamper with them. I know his code if there’s any and he knows mine. Our fingerprints are on each other’s phones, basically we share everything”, she added. This is something Okyeame Kwame himself agrees with. He tells Showbiz that although he has been tempted on a number of occasions, he has never been unfaithful to his beautiful wife. “I remember going to do a show in Europe and one of the girls involved in the event found a way to come to my hotel room when I had taken a shower. This girl was crushing on me right from when I landed at the airport. She was beautiful, she had long legs; she was young about 19 and you know my wife has meat and I had not had slim things like that in years. “Every logic in my head was like ‘Okyeame you have to hit this’ but I put my arms around her and told her when you are as old as my wife, you want a man, married to you not to do what you want to do with me with another younger girl so leave my room. She cried, she begged and asked for just one kiss and I refused. “It’s happened so many times but it is good to know that I have never succumbed to temptation. I want to be able to write in my tell-all book that I never cheated on my wife,” the Woso singer added. 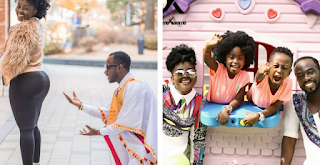 Being together for so long must not have been easy and they have their own challenges but Okyeame Kwame says their years together have been blissful and he has no regrets choosing to spend the rest of his life with Annica. “It has been amazing. I would say it’s been 90 percent of amazing and 10 percent of trouble. It’s been perfect and my definition of perfect is a balance of good and bad but it has been more positive than negative. “Sometimes the negatives come out of personality differences, difference in leadership or from something I have done but every time we face and jump over those hurdles, love grows stronger and both of us grow stronger. I’ve had a blast in this marriage,” he said. For the celebrated rapper, the success of their marriage can be attributed to a number of things but the number one is dedication. “Both of us are extremely dedicated to this cause. Constantly, we know that this is something that we must do. We know how difficult this is; we were both raised by different parents, from different backgrounds, from different circumstances and we have come together and we have brought two people into the world and it is important for us to stay together, stay in love, stay in lust for these kids to be able to grow up under a balanced parenthood,” he said. For Annica, she makes sure not to lose the things that attracted her husband to her to keep the marriage alive. “He likes full figured women so he doesn’t want me to lose too much weight and it’s good for me too. When I met him, I used to clean and till date I still do. Kwame likes clean things so I am constantly doing so. I make sure the children are also clean and well put together. “We try to say ‘I love you’ at least once or more times a day and we text each other all the time when we are away from each other,” she said. On their anniversary, Annica sent this heartwarming message to her husband!